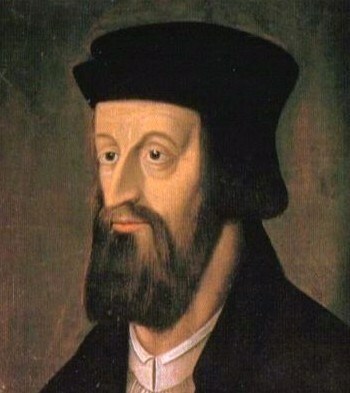 The fifteenth-century church reformer Jan Hus is known as much for his controversial execution at the Council of Constance in 1415 as he is for his teachings. His legacy for the Protestant Reformation remains that of a controversial late medieval pastor who sought the reform of the church in his lands. It was in fact the name of Jan Hus that was intoned against Luther during the later stages of the indulgence controversy. Luther soon found himself corresponding with Bohemian Hussites on matters of common agreement, leading him to write, “We are all Hussites.” Hus’s career as a reformer, however, owed as much to political tensions and revolution in Bohemia as it did to his theology. Jan Hus came from a family of little means in the southern Bohemian town of Husinec, from which he takes his surname. Though his date of birth is still uncertain, by 1393 he had enrolled in the arts faculty at the university in Prague. He would earn his bachelor of arts there in 1393 and his master of arts in 1396, thereafter beginning to teach in the arts faculty. By 1400, he was ordained a priest and enrolled in the theology faculty at Prague, while continuing to teach in the arts. A year later, he was named dean of the arts faculty, and then in 1402 was chosen by the Czech masters of Charles College to be preacher of Bethlehem Chapel. This role included supervision of two residential student colleges in connection with the chapel, where he served for the next decade. He progressed through the baccalaureate stages in theology, but the ongoing controversy over reform forced him to cease his studies. During this period, Hus became known for his passionate, orthodox sermons in support of reform, though he did provoke occasional controversy by attacking popular religious practices, such as pilgrimages to see bleeding hosts in Germany, and church teaching, such as the prohibition against unlicensed preaching. What both made Hus’s theology attractive and evoked opposition to it, however, was its similarity to the teachings of the notorious fourteenth-century English reformer, John Wycliffe (d. 1384). Wycliffe’s philosophical and theological writings had made their way to Prague during the 1390s, when Hus was a student. Hus himself had even copied some of Wycliffe’s manuscripts in 1398. Wycliffite theology spread throughout Bohemia, which itself had a long tradition of reform efforts and made it fertile ground for many of Wycliffe’s ideas, including his rejection of transubstantiation and the claims of the papacy, his belief that there was a true church composed of the predestined standing independent of the Roman church, and his support for secular lordship over territorial churches free from papal control. Hus did not agree with all of Wycliffite theology, in particular the rejection of transubstantiation, but he supported much of it and used it in support of moral, ecclesiastical, and theological reform. In 1403, forty-five articles were extracted from Wycliffe’s writings and condemned by the Germany faculty at Prague. This reflected a broader splintering of the Bohemian nation. Czech Bohemians had been at odds with the German Bohemians—represented by Bavarians, Saxons, and Poles—and sought their independence. With Wycliffe’s teachings continuing to gain ground, the archbishop of Prague compelled the Czech university masters to condemn the forty-five articles again in 1408 and thus suppress its influence amongst the Czech nationalists. The archbishop’s plan backfired, however, and resulted in further momentum for a Wycliffite reform of the Bohemian church with Hus as its most influential representative. This had immediate political and ecclesiastical consequences. In 1409, Hus and other Czech nationalist reformers persuaded the Bohemian king, Wenceslas IV, to support them against the German nations present on the Prague faculty. The Kuttenberg Decree of 1409 enabled the Czechs to take control of the faculty, forcing the Germans to leave for other universities. The faculty chose Hus as rector at Prague that same year, signifying his elevation to the head of its reform movement. The political and ecclesiological basis for their reforms was a Wycliffite view of sovereign territorial churches under the headship of a secular ruler, not the papacy in Rome. This not unexpectedly caused massive political turmoil and brought a stern reaction from the local archbishop and the Roman curia. In 1409, Archbishop Zbyněk appealed to Pope Alexander V, recently elected at Pisa to end the ongoing papal schism, regarding Wycliffite theology and secular encroachment on the church’s authority in Bohemia. Alexander responded with a 1409 bull that condemned Wycliffite theology and the list of forty-five articles already proscribed by the Prague faculty, and even prohibited preaching in Hus’s Bethlehem chapel. A year later, the archbishop burned all of Wycliffe’s works. Hus continued to defend Wycliffe and to preach from the Bethlehem pulpit, however, and soon appealed to the new pope, John XXIII, regarding the earlier bull of Alexander. As a result, Hus was excommunicated by his archbishop, thus beginning the ecclesiastical proceedings against him that would end in Constance. After his local excommunication, Hus was referred to Rome for his Wycliffite teaching and disobedience to ecclesiastical superiors in August 1410. He refused to stand trial in Rome and was excommunicated by the Roman court in February 1411. Popular support for him in Bohemia only grew as a result, forcing the archbishop of Prague to flee. Hus soon took on the status of both icon and pariah. Anti-papal polemicists flocked to his side as he continued to support the Wycliffite teaching of the reformers. His opponents congregated in Rome, including supporters of his exiled archbishop, German theologians who were forced off the faculty at Prague, and Czechs who opposed Wycliffe’s theology. The situation in Prague grew more unstable as a result of Hus’s opposition to the preaching of papal indulgences, authorized by John XXIII in 1412. King Wenceslas IV approved the indulgences because the profits were to be split between him and the pope, as did the anti-Wycliffite theologians at the university. Public demonstrations ensued, with Hus’s supporters declaring opposition to the pope, whom they proclaimed “Antichrist.” As a result three protestors were executed by Prague magistrates in July 1412. Shortly thereafter, Hus’s excommunication by Rome was declared in Prague, forcing him to withdraw from the city for two years. During this sabbatical, Hus wrote his more famous treatises, including his Wycliffite ecclesiology (the Latin De ecclesia) and his proposal for clerical reform (the Czech On Simony). In 1413, King Wenceslas hoped to overcome the religious controversy by establishing a royal commission to bring about peace, but it only dissolved over continued theological and political differences. The stage was then set for Hus’s fateful trip to Constance. The Council of Constance had convened in 1414 to bring end to yet another recent papal schism, as well as address the need for ongoing reform of the church and the problem of heresy—which included both Wycliffite teaching and Jan Hus’s support of it. Hus decided to attend believing that there was little hope for amicable agreement in Bohemia. The Holy Roman emperor, Sigismund, offered him a passage of safe conduct in spring 1414, but Hus proceeded without it. He arrived in fall 1414, then was imprisoned in November due to the presence of his enemies at Constance. Hus’s supporters, including Wenceslas, were finally able to convince the council to hold a public hearing for him in June 1415. Hus expected a theological debate, but he was simply approached with a list of thirty teachings ascribed to him. Even though he did not teach or hold all of them as charged, he nonetheless refused to recant, and in a purportedly hostile rant denounced the council. On July 6, 1415, the council condemned him as a heretic, stripped him of his ecclesiastical vesture, and handed him over to secular authorities, who burned him alive.